I have observed a disturbing trend in my social circles, among my coworkers, and dominating my social media feeds. Business. That is: busy-ness. 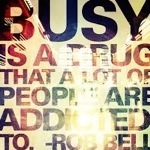 The glorification of busy. Constant bombarding messages framed to highlight how much any one person has accomplished today. Self-satisfied and self-congratulatory messages. What disturbs me is the insidious creeping subconscious idea that in order to be a good and valuable employee, mom, friend, human, one must be able to do it all. In one day. And then do it all again the next. I think we all know and recognize this attitude, I just didn’t put my mental finger on it until recently. I speak of the friend who fills her Facebook wall with colour commentary about the early morning workout, followed by preparation of gluten free lunches for the whole family, raw-feeding the dog, some “me time” meditation, and an underwear dance party – all before getting the kids out of bed. This is invariably followed by cool stories of innocent children’s breakfast banter, a full and important workday during which she has time to post some thought-provoking, deep insights displayed over calming ocean scenes, one saucy retro postcard quip, and a cute cat video. Next is an evening of taxiing the little darlings to events, snapping photos and collaging said events for Instagram, learning a new language while watching, and a satisfying vegan dinner (also photographed for posterity), followed by some quality time with her partner, a relaxing glass of wine in the bath and some late night crafting. I was convinced for a time that this was just a symptom of our “everyone is the star of their own reality show” culture. But as I’ve tried to simplify my own life, I’ve become more convinced that the Cult of Busy is a different thing altogether. I think it’s actually a more dangerous thing. Believing that everyone wants to always know my every thought and see photos of what I’ve cooked and the most recent and entertaining mess my kids made is perhaps, at worst, self-centered. But feeling pressure to be always busy, to schedule every last minute of the day, to be superwoman, is a beast of a different stripe. And yes, I said superWOMAN. In my experience, this is largely an affliction of my female friends. It wasn’t until I tuned into the theme that I was able to really think about it. I think it’s driven by the idea that all of us girls were taught who came of age in the 80’s and 90’s, that you can be anything you want. You can have it all, you can be an executive and a mom, and an active volunteer, and a community leader. And now, today, everyone is telling us about the importance of work-life balance and taking out time for yourself, that if you don’t put yourself first sometimes, you’re no good to anyone. I think instead of internalizing these messages as empowering, many of us have absorbed them as moral imperatives. It seems the take-home message is not just that we can do any of these things, but that we must do them all. I will jealously guard my unscheduled time, the two or three nights a week that have nothing on the calendar, the entire weekend day that I can open up. It does not mean I’m doing nothing in this time, but I will not schedule it. It has only been through opening up my time and refusing to schedule things as I used to, that I have found joy in spending days with my family doing something unplanned, or going for long walks with my husband and a good coffee. This is known, I’ve learned, as spontaneity. That’s something that’s very difficult to schedule. Link to the audio file of an interview I did on this post can be found here, check it out! I heard you on Gormley this morning. Great article! I just read this fabulous piece by Joshua Becker at http://www.becomingminimalist.com. Yeah, what HE said! So often we rush through this life, and congratulate ourselves that we’ve somehow made the day matter by “doing” things that don’t really matter. But today is different because I get to read you captivate the universe. Happy Friday!